Ollie Horgan felt Colm Deasy's sending off changed the complexion of Friday night's derby at Finn Park. 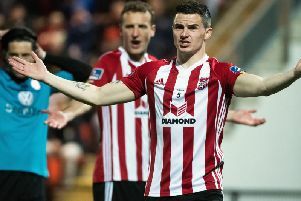 OLLIE HORGAN claimed Derry City celebrated Friday night's derby win like it was a cup final in a thinly-veiled barb at manager, Declan Devine and his playing staff. Devine sprinted onto the pitch at the final whistle to celebrate passionately with the Derry fans who were on the opposite side of the ground following a feisty clash in Ballybofey. Finn Harps boss, Horgan said Derry 'deserve huge credit' for clinching the win but felt the sending off of Colm Deasy and a 'mad decision' proved the turning point. In response to questions about the severity of the tackle on Ciaran Coll by his defender, Horgan claimed he didn't see the incident. "It was the far side of the pitch, but from the roar from the Derry fans who I'm sure they are very honest suggested it was a bad tackle but I have to say I would have to look at that on video again, " said Horgan. "We looked at the disallowed goal but am I complaining, not from my side I didn't see it. It looked like a poor tackle. I think it was Ciaran Coll was it? Yeah, we wish Ciaran the very best in his recovery." Harps had Nathan Boyle's goal disallowed in the first half with the scores level and Horgan couldn't see why referee, Neil Doyle ruled it out for obstruction. "I've watched the replay after the game and, do I blame the referee? No. But he went and booked the wrong player for interfering. I'm not blaming the officials. Derry to be fair were the better side when it was 11 v 10. It was very even when it was 11 v 11. "They celebrated like it was a cup final to be fair to them and they deserve huge credit. Declan has put together a great management side and a very, very strong side and that's them away from home. They'll take some beating by anybody at the Brandywell never mind away from home but that was our opportunity today we felt. Once again someone somewhere made a mad decision which has cost us. "Would Derry have went on and won 3-2 in the end, no-one knows but it was the sending off which cost us, without a doubt. There's no guarantee we would've got anything out of it but we were right in that game until that and then the complexion changed." Harps remain rooted to the bottom of the table and without a win after the first round of fixtures but Horgan isn't getting carried away having lost out to Derry by the narrowest of margins in front of the biggest crowd of the season at Finn Park. "We lost a year ago to Cobh Ramblers 1-0 here so would we take that result tonight instead with the crowd, the atmosphere and the excitement of it we would take it. It's hard work without a doubt. We do lack quality in certain areas but that costs money and the reality of it is we don't have the budget some teams have with the exception of UCD who are a huge credit in the manner in which they do things as they're basically punching above their weight. 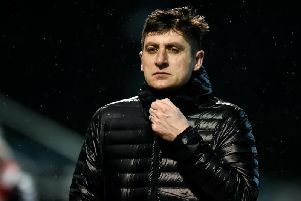 "We have a very together group and we'll take it on the chin and move on to Bohs next week which will be another savage game The home advantage is a huge one in this league. If you go in and play Derry they have a huge advantage at the Brandywell and would be in much more control of the game than they were tonight. We felt we had an opportunity there tonight and once again fell short by the narrowest margin. "It's about whether we can stay in this division or not," he added. "We have a good bunch and that's not being sympathetic for them in any manner. Would I prefer to have a horrible bunch and be further up the table? I would but that's not the way it."